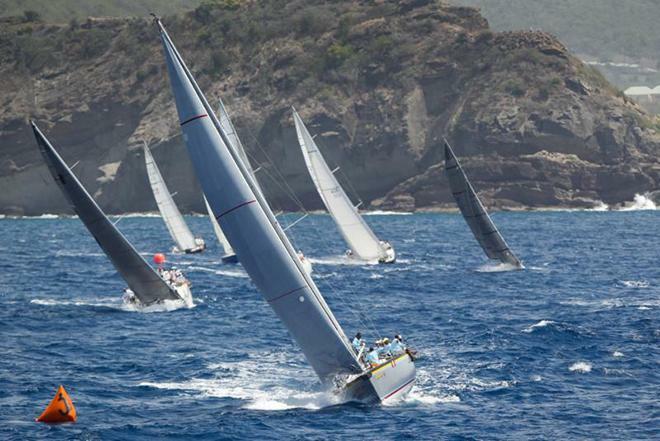 Antigua Sailing Week – last day! I am sorry that Antigua Sailing Week (ASW) is coming to an end. It has been a lot of fun. Our team has been a case study of the well-established phases of group dynamics – forming, storming, norming and performing. About day 2 of the race we had some tensions as we figured out the roles of our team. I admit during this phase I was not a demure observer. In the heat of the competition, I yelled at someone on our team, saying, “We are in a race!” They were on the deck taking their time to manage the spinnaker. I later apologized. But now we are operating like a well-oiled machine. We placed third yesterday in the big boats category, out of a possible six contenders. We are on a Farr 65. The longest boat in our category is SV Dharma at 95 feet. The ASW race committee assigns boats various handicaps to even out the competition. When we are in close quarters it feels like we are being chased by pirates. It is quite a sight with all the sails taking the same angle. We have had pretty light winds so far. But, I have a feeling that sailing conditions will be a bit different today. There was a cold breeze on my legs this morning. I am sleeping on deck in a silk sheet bag. I was wearing shorts last night and could have really done with a pair of pants. The other two women who sleep on deck were wrapped up in pashminas this morning. We sleep on deck because it’s very hot down in our bunks. I can’t complain. I’m looking forward to another great race day here in Antigua.